Today I decided to introduce Ethan to yoga. I had great intentions of doing Mum and Baby yoga with him when he was tiny, but time passed so quickly that before I knew it he was too big / too mobile to go. I did a training course to teach yoga to children, so I thought it was about time to try it out with Ethan. 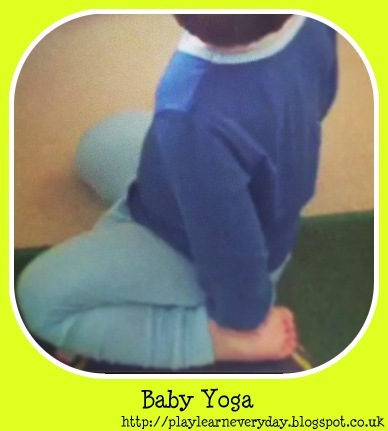 We started slowly today, just watching an episode of Waybuloo and doing to "yogo" poses along with them. Ethan thought it was hilarious when I got down onto the floor into these funny positions, but happily allowed me to put him into the poses as well. Of course he would only manage to hold a pose for a second, but it was lots of fun and yoga is great for his Physical Development and it can be very calming which would be good for his Personal, Social and Emotional Development as well.